Pre-revolution Russian motor vehicles, were there such things? The question that forced me to acquire this in depth and heavily researched book. The answer I was looking for is yes and very impressive machines they were too. You see, Russian vehicles were as advanced as most European or American marques before the Czar found the Winter Palace his last refuge. First seen in 2009, this Veloce book was produced in association with The Michael Sedgewick Trust which was set up to commemorate the motoring researcher and author Michael Sedgwick (1926–1983) and encourages the publishing of new motoring research. It’s also just been reduced to half price, which offers brilliant value as the detail accumulated by Maurice Kelly is extraordinary and combined with illustrations courtesy of Alexandr Zakarov it’s all very absorbing. A real step into the unknown certainly and the rare black and white images transport the reader, not just to another time, but to a mysterious and uncharted motoring world. The western nations were certainly aware of the engineering excellence available in Russia and when Andrei Nagel took victory in the 1912 Monte Carlo Rally this was confirmed; especially as their Monako S24/50 Torpedo Roadster started its journey overland from St Petersburg. 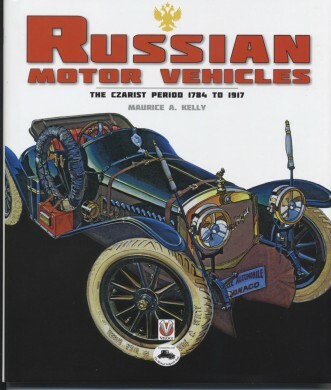 The Russians first car with internal combustion engine had arrived in 1896 and by 1913 they were producing land speed challengers and Grand Prix racers of five litre capacity. World leading suspensions and superb tyre technology are all details the book delves into, plus motor cycles, military and the mighty trucks built for the harshest of environments. Russian coachbuilders didn’t always conform to fashion with an ability to pen the strangest of designs; function over flair maybe. Well, who else would put tracks on a Rolls Royce Silver Ghost! One of the many half tracked vehicles using the “Systeme Kégresse” developed by Frenchman Adolphe Kégresse who had been in charge of the Czar’s garage. The Rolls was taken over post 1917, as were all the Czar collection and was used by Lenin himself. The authors very matter of fact writing style is initially very exact but seems to loosen as the book progresses and becomes a relaxing but still precise read that I really enjoyed. Both his public school education and engineering background come through in his writing but his research that led him to Russia in completing this works must be applauded. A massive variety of machines that extend from the finest this era offered to ridiculous contraptions that take some explaining; this book deals with its subject comprehensively.